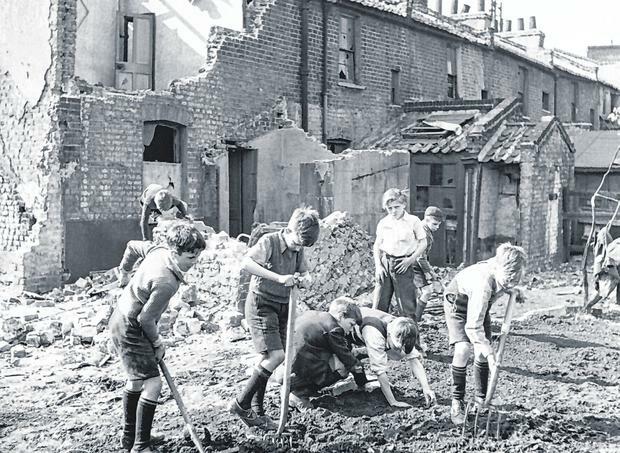 Damage: Boys dig in the rubble of a bombed street in London during World War II. It must surely be a great relief for Fianna Fáil that the Brexit debacle will carry on until at least October. The relief I refer to has nothing to do with the Border or any economic damage it may do to the country, but more to do with members’ own political careers. With the current homeless, housing and health crises and Fianna Fáil being the tail that is wagging the dog in the Dáil, the last thing it wants is to go to the people until there is an improvement in those social issues. Until that happens, Fianna Fáil can continue this farcical Confidence and Supply Agreement with Fine Gael and claim it is in the best interests of the country. For the same reasons, this will also suit Fine Gael, which will be quite worried about the same social issues affecting their re-election prospects and the relative closeness to Fianna Fáil in the polls. Those poll statistics, combined with the social issues mentioned, would suggest Confidence and Supply Agreements will continue between these two parties with either Fianna Fáil or Fine Gael as the lead party for several years to come. This week MPs voted on whether to support Theresa May getting an extension from the EU so her government could deliver Brexit. Some 420 were in favour and 110 were against. The breakdown tells us the UK Labour Party is disciplined – only three Labour MPs voted against the motion – whereas the Conservative Party looks utterly out of control: 99 of them voted against their own prime minister trying to deliver Brexit, while 80 Conservatives abstained from taking a position. How can any politician elected to represent a constituency of citizens argue abstention is an option? Politicians are not paid to sit on the fence. A general election is now essential to get the UK out of this mess. Every candidate should be allowed to campaign as an independent with a manifesto stating their preference from three options: No deal and a people’s vote; deal and a people’s vote; or revoke Article 50 and hold a citizens’ assembly on the EU. They could also state their formal party affiliation if they still had one. The resulting independent MPs elected would reflect exactly what the electorate wants in terms of the UK’s approach to Brexit and the EU. A major benefit would be the end of the two-party system. Three distinct strands of the UK’s future relationship with the EU would emerge. A coalition of independent MPs would form a government based around Britain’s inextricable link to the EU which, for the foreseeable future, remains the geopolitical reality of the island of Ireland. Simple-minded people who can only think in a straight line cannot understand the UK’s manoeuvring, play-acting and whiling away the time on Brexit. It is my belief the UK wants to crash out of the EU without a deal so it can put its Border across Ireland – but it can’t do that unilaterally. It is waiting for the EU to do something so it can blame it for the Border. Let’s make no mistake, this is a big game of chicken. If Ireland and the EU keep cool, calm and collected, the UK will never get out of the EU. We must not forget there are only two solutions to the Irish Border problem. Either the British stay in the EU or they relinquish their foothold in Ireland. I would like to send an open letter to RTÉ and ask if it is possible to help it out with its shortage of staff. I have noticed that recently the same people keep turning up in every programme broadcast on RTÉ. For example, I would particularly like to help them out with replacing poor Marty Morrissey, who must be run ragged over the last few years, running from GAA matches to ‘Dancing with the Stars’, to modelling in New York, to hopelessly emulating Bear Grylls in the wild, to meeting expats in Adelaide and Perth in far-flung Australia. Not to mention the numerous times he hosts a farming programme or two on the radio or turns up as a guest on a TV or radio show talking about his time either dancing or modelling or running around the countryside while working for RTÉ. The poor man must be absolutely exhausted. Please consider my offer to replace him before he expires from over-exposure. I am sure you have heard many “man bites dog” stories in your time, but this one takes the dog biscuit. Recently I saw a sign outside my local GP’s surgery in Carrick-on-Shannon which stated that the waiting time for blood tests is one month. Today I noticed a sign outside a vet’s office in Carrick-on-Shannon that read “blood tests in two hours”. Public health medicine has some way to go. The teachers, the nurses, the bus drivers, the rail workers and many other groups have unions to protect them against any unfair conditions being foisted on them by the government of the day. It is now time that a new union be formed by the house owners of rural Ireland to fight against the proposed imposition of the property tax increase. This property tax increase will be applied after the general election in the late autumn. House owners in the rural areas where they have no public transport, no post offices, no banks, no Garda barracks and live miles from the nearest shop will be most affected. The Government finds the house owners a soft target and has no hesitation in increasing the property tax. Now is the time for people to form the house owners of rural Ireland union – to fight for the rights and interests of all the rural house owners across the country. THE demolition of cities up until the end of World War II was a historical disaster. In Italy, thousands of houses and apartments were reduced to ruins. In Britain, 202,000 houses were destroyed and the V weapons rendered a further 255,000 uninhabitable. France had suffered even more, 460,000 buildings gone and a further 1.9 million damaged. Germany, meanwhile, lost 3.6 million apartments – or a fifth of all dwellings. In the Soviet Union not only were many of the major cities laid waste, but also 1,700 smaller towns and 70,000 villages. So it went on in Poland and the rest of Europe through which the war passed – sometimes twice in the case of most of Europe, by the Germans ‘on the way out’ and the Russians ‘on the way back’. In Asia the position was just as bad. There were nine million homeless in Japan and the estimate for China was 100 million. The years after 1945 saw the most radical rebuilding in the history of the world’s cities, but before this new world began to rise from the ashes, there was a great deal of debate. The one thing almost everyone agreed on was it should not be left to the “free market”. Private landlords and developers had no incentive to create spacious, healthy environments for their tenants in the case of social housing, or affordable houses for purchasers. Quite the opposite, in fact, their only interest was to maximise their profits. According to architects like Le Corbusier, one of the most influential planners of the era, governments which allowed the free market to act unchecked were effectively failing the people who had elected them. We continue to disregard history at our cost – and so we place our recovery in the hands of “vulture funds”, landlords and the “benevolent” private sector.